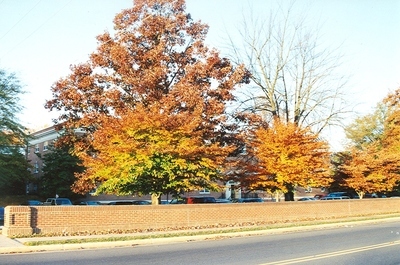 "Row of beech trees along Dinkle Ave in the early 2000’s" by L. Michael Hill Ph.D. This row of beech trees, Fagus grandifolia (Fagaceae) was planted when the wall you see was put up along Dinkle Ave in the early 2000’s. A similar stand is along the wall on the other side of Dinkle in front of Geisert Hall.